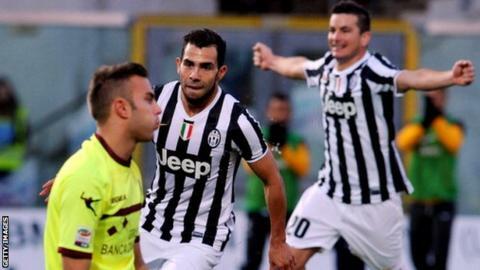 Carlos Tevez scored as Juventus went top of Serie A with a hard-fought win at Livorno. Antonio Conte's side were frustrated by Livorno's defensive tactics before Spanish World Cup winner Fernando Llorente struck in the 63rd minute. Tevez sealed the points 12 minutes later from close range, the 29-year-old's seventh league goal since joining from Manchester City in the summer. The result lifted the reigning champions two points clear at the top. Roma, who started the weekend at the summit, missed the chance to go back above the Old Lady when they could only draw with Cagliari on Monday. Match ends, Livorno 0, Juventus 2. Second Half ends, Livorno 0, Juventus 2. Attempt missed. Luca Siligardi (Livorno) left footed shot from outside the box is close, but misses the top left corner. Assisted by Leandro Greco. Attempt blocked. Andrea Pirlo (Juventus) right footed shot from the centre of the box is blocked. Assisted by Paul Pogba. Corner, Livorno. Conceded by Martín Cáceres. Attempt blocked. Leandro Greco (Livorno) left footed shot from the left side of the box is blocked. Assisted by Luca Siligardi. Foul by Federico Peluso (Juventus). Pasquale Schiattarella (Livorno) wins a free kick in the attacking half. Attempt missed. Emerson (Livorno) left footed shot from the left side of the box is close, but misses to the left. Assisted by Leandro Greco. Foul by Fabio Quagliarella (Juventus). Miguel Borja (Livorno) wins a free kick on the right wing. Foul by Mirko Vucinic (Juventus). Emerson (Livorno) wins a free kick in the defensive half. Substitution, Juventus. Federico Peluso replaces Kwadwo Asamoah. Substitution, Livorno. Giuseppe Gemiti replaces Federico Ceccherini because of an injury. Andrea Pirlo (Juventus) wins a free kick in the defensive half. Foul by Pasquale Schiattarella (Livorno). Attempt blocked. Cristiano Piccini (Livorno) right footed shot from outside the box is blocked. Assisted by Andrea Luci. Delay in match Federico Ceccherini (Livorno) because of an injury. Substitution, Juventus. Mirko Vucinic replaces Fernando Llorente. Substitution, Livorno. Cristiano Piccini replaces Ibrahima Mbaye. Substitution, Juventus. Fabio Quagliarella replaces Carlos Tévez. Attempt saved. Kwadwo Asamoah (Juventus) left footed shot from the left side of the box is saved in the top centre of the goal. Assisted by Claudio Marchisio. Andrea Luci (Livorno) is shown the yellow card for a bad foul. Paul Pogba (Juventus) wins a free kick on the right wing. Foul by Andrea Luci (Livorno). Goal! Livorno 0, Juventus 2. Carlos Tévez (Juventus) right footed shot from the centre of the box to the bottom left corner. Assisted by Fernando Llorente. Carlos Tévez (Juventus) wins a free kick in the attacking half. Attempt saved. Emerson (Livorno) left footed shot from long range on the right is saved in the centre of the goal. Substitution, Livorno. Miguel Borja replaces Innocent Emeghara. Kwadwo Asamoah (Juventus) is shown the yellow card for a bad foul. Foul by Kwadwo Asamoah (Juventus). Emerson (Livorno) wins a free kick in the attacking half. Attempt missed. Carlos Tévez (Juventus) right footed shot from the right side of the box is close, but misses to the left. Assisted by Simone Padoin.